This post originally appeared on The Hoplite, the ARES company blog. The seizure of former president Viktor Yanukovych’s estate in Mezhyhirya, an hours drive from Kiev, turned up a range of interesting arms and munitions. Nearby, a variety of ammunition was recovered from a private lake, including the cartridges shown in the image above. 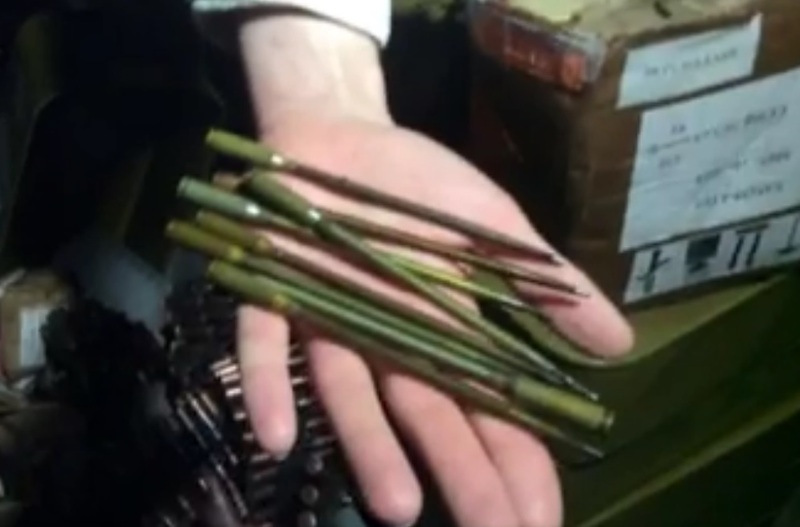 These are 5.66 x 39 mm rounds for the Russian made APS (Автомат Подводный Специальный) underwater “assault rifle”, which are available in three types. Two are designated as the MPS (МПС; морской патрон специальный) and MPST (МПСТ; морской патрон специальный трассирующий). The final is a training cartridge of unknown designation. Whilst the APS is commonly referred to as an assault rifle, the barrel of the Avtomat Podvodny Spetsialny or “special underwater assault rifle” is not actually rifled, and the projectiles are stabilised by hydrodynamic effects. The MPS (Morskoy Patron Spetsialnyy; “special marine cartridge”) and MPST (Morskoy Patron Spetsialnyy Trassiruyushchiy; “special marine tracer cartridge”) cartridges feature long, slender dart-like projectiles of a nominal 120 mm length. The projectiles are of lacquered steel, with the MPST projectile featuring a tracer canister at its base. The lacquered steel cartridge cases are sealed at the case mouth and the primer annulus to prevent the ingress of moisture. The cartridges above appear to be MPS rounds. Ukrainian military frogmen are known to use the APS rifle and associated MPS/MPST ammunition. Sources in Ukraine have also indicated that the presidential security detail also had frogmen on the team, and it seems likely that the ammunition documented belonged to that unit. Further information, including images, can be found on the ARES company blog, The Hoplite. Being a Ukrainian native, I’m disappointing with the screwed up dictatorship that the country went through..
And flee the country in the end is pathetic. However, the Ukrainian special forces are doing a great job at seizing ex presidents belongings.